Russian, Israeli leaders address tensions over Syria following chemical weapons attack by Assad regime, alleged Israeli airstrike. Prime Minister Binyamin Netanyahu spoke to Russian President Vladimir Putin over the phone Wednesday. The two leaders discussed the situation in Syria. The conversation was initiated by the Israeli side, Russian media quoted the Kremlin as saying. “Vladimir Putin stressed the fundamental importance of respecting the sovereignty of Syria, called for refraining from any actions that might further destabilize the situation in this country and pose a threat to its security,” the Kremlin added. 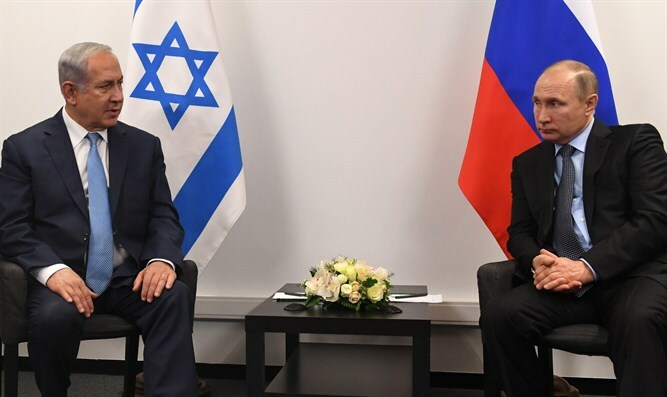 Netanyahu reiterated to Putin his position that Israel will not allow Iran to establish a military presence in Syria, according to the Prime Minister's Office. Russia had previously condemned Israel for an alleged airstrike on a Syrian airbase. 14 people were killed in the airstrike on the T-4 Airfield, including several Iranian soldiers. The airstrike followed an alleged attack with sarin nerve gas by the government of Syrian President Bashar al-Assad which left dozens of civilians dead, including many children. The chemical weapons attack drew international condemnation, including from Israel and the US. Russia, an ally of the Assad regime, has defended Assad from criticism and vetoed a UN Security Council resolution calling for an investigation into chemical weapons use in Syria.